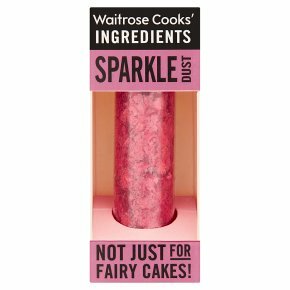 Edible red sparkle dust, perfect for decorating biscuits and cakes. Sparkle dust. Decorate your cakes. Perfect for decorating biscuits and cakes. INGREDIENTS: acacia gum, colours (anthocyanins, curcumin), acidity regulator (citric acid), rapeseed oil, emulsifier (polysorbate 80), preservative (potassium sorbate).